BIG RED SUN is the story of a family of musicians. Eddie and Helen Daimler were great swing musicians in the 1940s, but now in the early 1960s their teenage son Harry, a budding songwriter himself, lives alone with his mother and writes songs about his great war-hero father. In an effort to write more truthfully, Harry unearths a dark family secret. World War II carved a silent divide between those who fought and those who waited – a truth unshared. In a few short years, the simple melodies of Kern and Berlin were replaced by the dizzying energy of jazz and the beginnings of rock and roll. This is the story of a family that changed as much as their music did. Winner of the Harold Arlen Award from ASCAP. Watch this NBC 10 Philadelphia interview with John Jiler and Georgia Stitt. Read this interview with BroadwayWorld about the World Premiere production (May 31-June 17, 2018) in Philadelphia. Read this interview about BIG RED SUN with Georgia Stitt and John Jiler by 54Below’s Jennifer Tepper. Read this interview by Bethany Rickwald at TheaterMania — Composer Georgia Stitt Looks Forward to a Bright Future for her musical BIG RED SUN. World Premiere Production at 11th Hour Theatre Company in Philadelphia, May 31 – June 17, 2018. Megan O’Brien, director. Participation in NAMT’s 46th Minute Series, October 18, 2017, NYC. Concert Presentation at 11th Hour Theatre Company in Philadelphia, February 27-29, 2016. 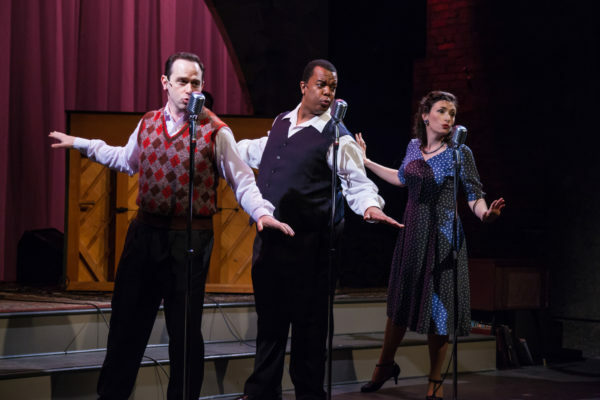 Concert Presentation as part of “New Musicals at 54.” January 19, 2016 at 7 and 9:30 pm. Featuring new orchestrations! Abridged reading presented at CTI (Commercial Theatre Institute) in NYC. April 12, 2014. View videos here. 29-hour staged reading at The York Theater in NYC as part of NEO Residency. Lisa Peterson, Director. April 11, 2013. Entire show presented at University of Nebraska, Lincoln in a staged reading. Alisa Belflower, Director. March 12, 2012. Show chosen to be presented in National Alliance of Musical Theatre’s Festival of New Musicals, October 21-22, 2010 in NYC. Entire show presented as part of OCUStripped, February 8-9, 2009, at Oklahoma City University. Steven Fontenot and Aaron Brown, Co-Directors. Private reading of entire show at ASCAP in New York, June 2007. Developmental Reading of entire show at TheatreWorks in Palo Alto, California, April 2006. Annette Jolles, Director and Tom Murray, Music Director. Act One presented at ASCAP Musical Theatre Workshop, April 28 and May 11, 2005. Annette Jolles, Director, and Tom Murray, Music Director. 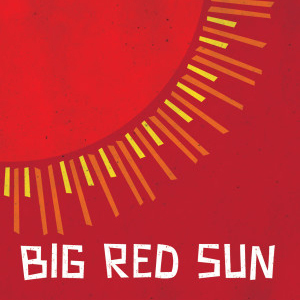 BIG RED SUN is the story of a son’s search for his father through post-World War Two America. Harry Daimler is a restless, imaginative teen-aged musician stuck in a soulless New York suburb in 1961. Throughout his young life he’s accepted his mother’s explanation of his father’s absence: Eddie Daimler, a well-known 1930s swing musician, was killed in WWII action with the American Army in France. But when Harry presents a song about his Dad at their hometown’s 15-year memorial service and his father’s name is not read among the list of war heroes, Harry begins to question his mother’s simple explanations. By grilling sources as diverse as the local town clerk and a jazz trumpeter who once played in his father’s band, a portrait emerges of the real Eddie Daimler. For the first time, Harry is beginning to know his father, and every time he learns something new, the play reveals the information in flashback. Harry (in the present) and Eddie (in the past) are telling their stories simultaneously. Harry’s relentlessness to understand what happened to his family forces him to confront some lies, some misunderstandings, and the one big untold secret that was meant to have been buried with the war. 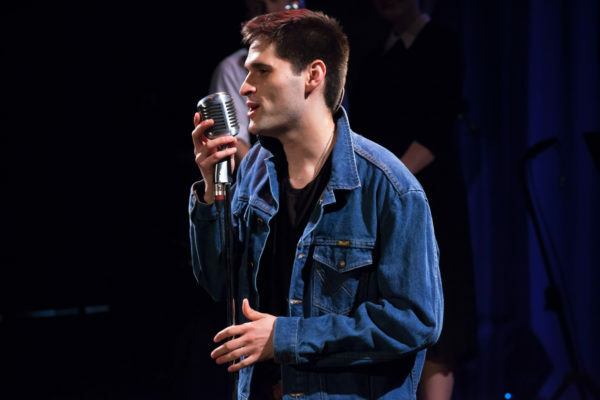 As his journey for the truth stirs up confusion, frustration, and fury, so does the score, following the evolution of the American music from the late ‘30s to the early ‘60s, moving from Klezmer to Swing to Modern Jazz to the first raw sounds of Rock and Roll. The platitudes of the 1950s are blown away by the plugging in of an electric guitar as Harry finally screams at his mother and ventures out on his own. The period just after World War Two is mystifying to those who don’t remember it. A terrible enemy had been beaten, the troops flooded home, there was dancing and kissing in the street… it should have been a period of unalloyed joy, an MGM musical come to life. For many people it was. The economy finally awoke from its long sleep, the GI bill essentially created the suburbs and allowed tens of thousands of returning soldiers to come home to a clean, ordered world. But it wasn’t long before the dark clouds began to roll in. Not just McCarthyism—although that certainly qualifies as a dark cloud—but the basic complacency of the era totally baffled the children of the WWII generation. Levittown was a hollow pot of gold at the end of the rainbow. They were grateful for their father’s sacrifices, to a point. But they rejected the blandness and the compromises that followed it. The poignancy of that rift between father and son is what drives our story. It’s a tale that we wanted very much to tell with music, because music seems like the perfect bellweather for the times. Soldiers returning from the war looked around and said “What happened to Jerome Kern? What is all this minor-key jazz and rock and roll? What happened?” In the case of the main character, a jew who struggles with his identity, the change is even more bewildering. Having parlayed his klezmer roots into a career in swing music, he come home to find himself out of vogue. He must create a new identity for himself, musically and personally. The twenty year period that included the end of the Depression, the war, and its tumultuous aftermath seems to us the seminal moment of the last century and one of the most important times in American history. There was a “big red sun” on the horizon, marking the optimism of the fifties, the boiling dissatisfaction of the younger generation about to enter the fraught 1960s, and the dawning of a new musical era.